The other night I read a magazine article on the construction of the Giant Magellan Telescope (GMT), an international collaboration to construct the greatest earth-based observatory up in the Andes Mountains in Chile. The technology involved in manufacturing the massive set of primary mirrors, with an effective diameter of 24.5 meters (80 feet), is remarkable, but what really excites my imagination is the concept of “adaptive optics.” The primary mirrors will gather the faintest light and reflect it onto a set of secondary mirrors, which will in turn focus the light onto an array of sensors to capture the broadest range of wavelengths. These secondary mirrors are designed to adapt their shape in extremely subtle ways to compensate for the distortions of light caused by earth’s atmosphere. 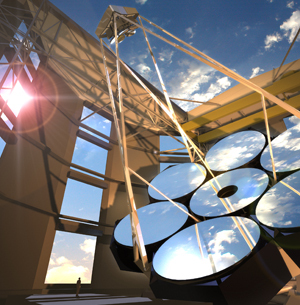 Lasers around the telescope will probe the sky in order to measure these distortions, allowing the telescope to adapt the shape of its secondary mirrors and collect the oldest and faintest light at the highest possible resolution. While it is of course preferable to avoid atmospheric distortions altogether by locating a telescope in space (like the Hubble Space Telescope, whose mirror is a mere 2.4 meters), it is difficult and expensive to place and maintain equipment there, making earth-based telescopes an important component of astronomy for the future (see this link from Harvard Magazine for the full article). This entry was posted in Divrei Torah and tagged hubble space telescope, rabbi isaac luria, religion, science, spirituality, theology on May 3, 2013 by Rabbi Danny Nevins.